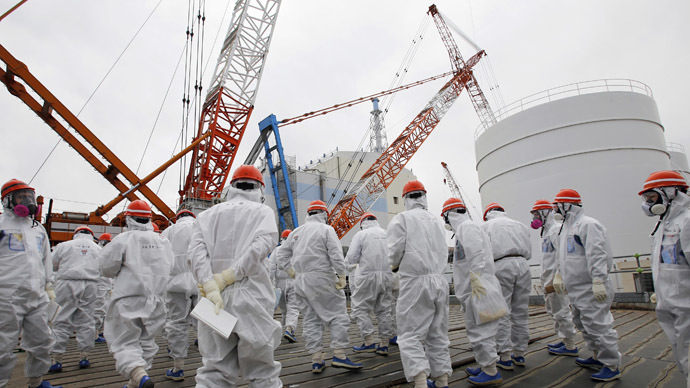 The Tokyo Electric Power Co. says almost all the nuclear fuel in one of its reactors at the Fukushima plant has melted. The discovery at Reactor 1 should help with the clean-up operation and decommissioning of the stricken nuclear power station. The Tokyo Electric Power Co. (TEPCO) and the International Research Institute for Nuclear Decommissioning (IRID) have been working since February, studying the interior of the reactor building at the Fukushima No. 1 nuclear plant. TEPCO, which is in charge of operating the plant, used cosmic rays to inspect the reactor building. By analyzing the flow of muons, which are subatomic particles generated when cosmic rays collide with the atmosphere, the utility was able to create an X-ray like image of what the inside of the reactor looks like. Muons can pass through concrete and iron, but they are blocked and change direction when they hit high density substances, such as uranium or plutonium. This creates a ‘shadow’ and allows them to draw a map of where the fuel is in the reactor. TEPCO came to the conclusion that the fuel had melted because no fuel shadows showed up around the reactor’s core and it was therefore likely that it had fallen to the bottom of the building and into a containment vessel. "While our previous analysis has already strongly suggested that fuel rods had melted down, the latest study provided further data that we like to regard as a progress in our effort to determine the exact locations of the debris," said a TEPCO spokesman according to AFP. TEPCO now faces the challenge of trying to remove the melted fuel rods from the reactor, which is likely to be carried out by robots, due to the extremely high levels of radiation in the building, which suffered a meltdown following the March 2011 earthquake and tsunami. The condition of Reactor 1 was the first to be confirmed by the plant’s operators. Reactors 2 and 3 are also believed to have suffered meltdowns. The latest discovery is positive for TEPCO, who have suffered a number of problems in trying to clean-up the reactors at the Fukushima plant. Last month, a team of 15 experts from the International Atomic Energy Agency (IAEA) said Japan had made “significant progress,” but added there was still a lot of work to be done. “The situation, however, remains very complex, with the increasing amount of contaminated water posing a short-term challenge that must be resolved in a sustainable manner,” Juan Carlos Lentijo, IAEA director of Nuclear Fuel Cycle and Waste Technology said in February. “The need to remove highly radioactive spent fuel, including damaged fuel and fuel debris, from the reactors that suffered meltdowns poses a huge long-term challenge," he added. Underground waters flowing into the plant and the accumulation of tainted water are factors that make the situation more complex. The other problems are linked with management, storage and the removal of spent nuclear fuel and fuel debris, the IAEA report stressed. TEPCO came in for criticism for neglecting to report a radioactive leak for 10 months. On February 26, it was revealed that a drainage ditch which receives runoff water from the highly-contaminated roof of Sector 2 was transporting water rich in cesium together with rain into the sea, and that the leak had been discovered back in May. The troubled nuclear operator has been trying different strategies to halt the spread of radioactive materials for four years, with multiple hurdles to overcome and costs spiraling out of control. The protracted cleanup is said to require decades to fix before people can start living and farming in the vicinity again, while the costs are projected to be in the billions, with the government stepping in to help as well.